Stay connected to Clean Green Action ​with the latest news and updates. Clean Green Action is hosting a Climate Change Forum April 30 in the McMillan Memorial Library Fine Arts Center. The forum will begin at 6 p.m. with a presentation by Professor Emeritus Alan Haney on the most recent report from the Intergovernmental Panel on Climate Change (IPCC). ​Nancy Turyk, Community Development Educator with UW-Extension Wood County, will offer advice for individuals and present on what is being done at the local level. 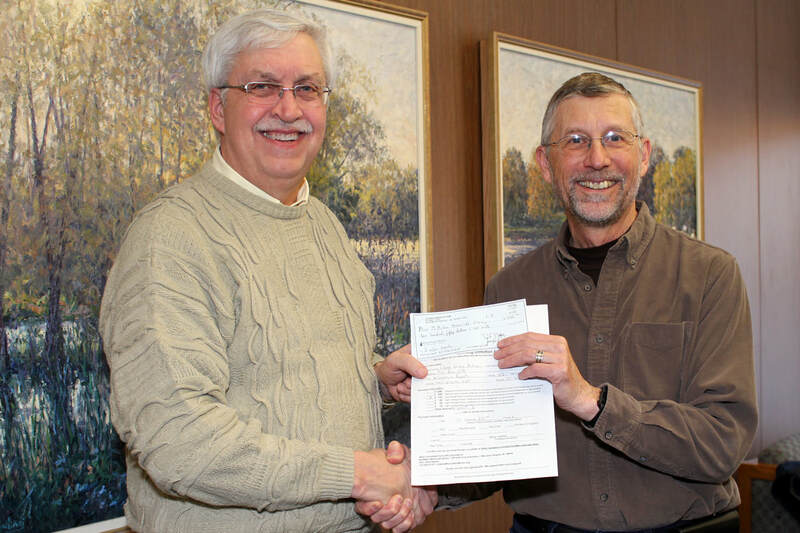 Joe Ancel, right, Chair of Clean Green Action, recently presented McMillan Memorial Library Director Andy Barnett, left, with a donation of $250 from Clean Green Action to support the library’s solar panel project. In the Summer of 2017, McMillan Memorial Library installed the largest rooftop solar array in Wisconsin Rapids. The array transitioned the Library to a greener future, saves the library money, and provides green power to our community. Two thirds of the $420,000 project is paid for, with Viking Electric and its owner Scott Prahl, funding much of the project and utilizing the associated tax credits. The Library’s Endowment also contributed funds for the project. McMillan Library is hoping for community support to fund the remaining third of the cost. Clean Green Action is a local nonprofit environmental group that focuses on sustainability and reducing impact on the environment. In keeping with its mission to create a sustainable community through education, recycling and conservation efforts, Clean Green Action supports the library’s use of solar and contributed $250 to the Solar Power @ McMillan fund.